On the initiative of our friend of Geneva Edouard Sommer, we met, Christian, photo-2 Luc and I, in October 2007, Saturday 20th, in Chermignon-d'en-Haut, a pretty village above Sierre, in the Valais, in good company for un unsurpassed day, and which will work all participants for ever. 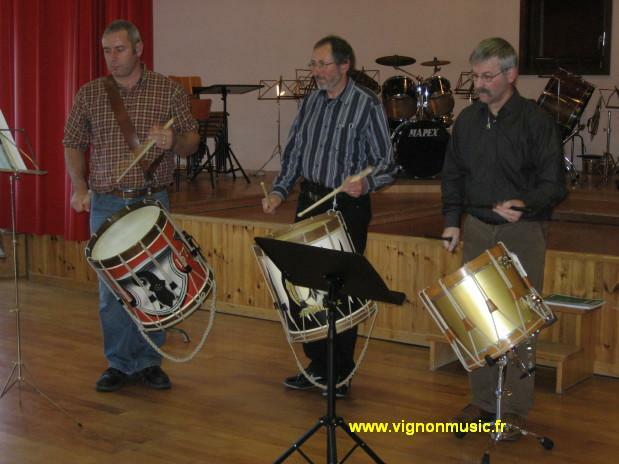 Twenty-two drummers were there, among which seven Swiss champions : Ivan Kym (2006, 2002, 1998) Guillaume Rey (1994) Roman Lombriser (1990) Remigius Rupp (1986) Hans Luterbacher (1978) Peter Achermann (1974, 1970) without forgetting some VIP, as Louis Salamin and the oldest Daniel Quinodoz, for whom a complete surprise had been carefully handled. During the drink, the mood was brought by a collective, then individual performance of these champions. Dialogues, always rewarding, continued during the traditional local "raclette". Then we arrived at the active participation of the French drummers, comparison of the equipment and especially regulating and sound. We came of course to speak of the "coulé" see on worbook , of this diverting, and his valaisanne variant, the "fignolement". These two rudiments seem too close to have distinct origins ; they are mainly different one of other by the place of the accents. Some chosen pieces showed the talk. 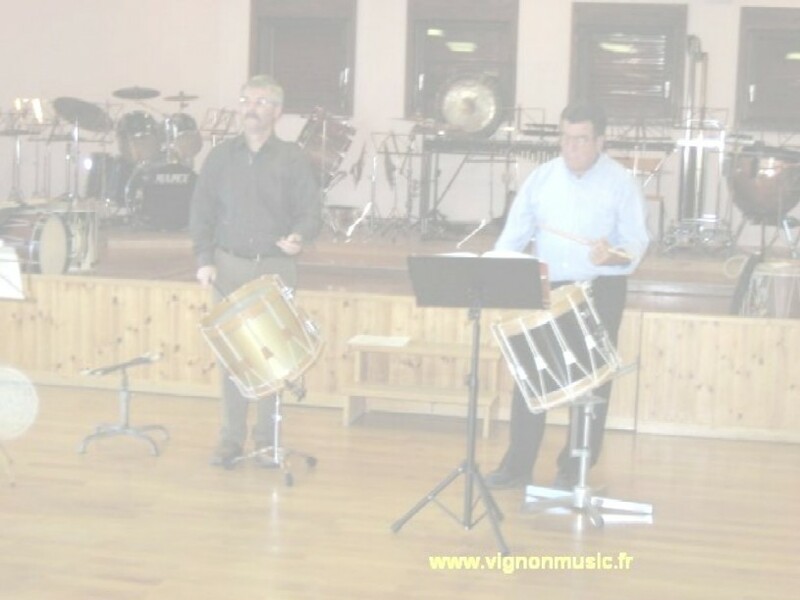 A big instant for me consisted in the execution of "Der Grizzli" photo-1 (Baloises Marches) with the composer (Hans Luterbacher) and also Ivan Kym. With the aim of return on a "very French" piece. You can easily understand that this day passed very quickly, especially too because it was put under the sign of complete simplicity and friendship. Edouard and his team really worked well to organize this meeting, perform material realisation, so that everyone came back to home full of good memories and with wish for a new day like this one.